If you're the type who loves to graze on lots of different food tid-bits and offerings during gatherings, then cheese boards and appetizer platters are definitely for you. Standard cheese boards usually offer about 3 kinds of cheese, of different textures, along with a variety of crackers. But nothing beats an appetizer board for variety and interest. Cheese, crackers, dried fruit, fresh fruit and vegetables are all appropriate. It's delicious and a fun treat for guests! 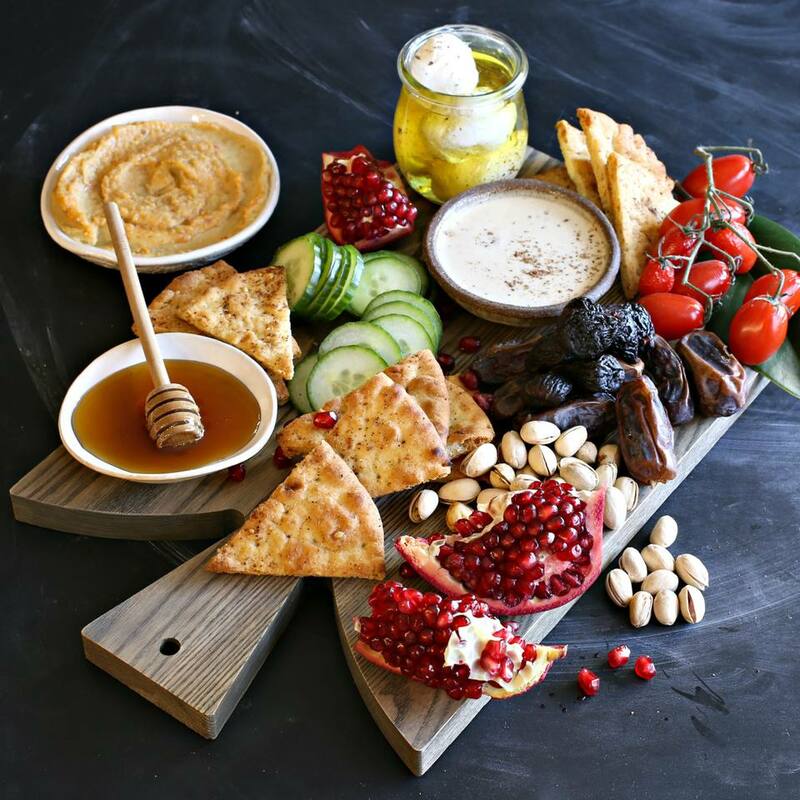 This party platter offers some classic Middle Eastern flavors for a creative twist on appetizers. Note: while there are multiple steps to this recipe, this cheese board is broken down into workable categories to help you better plan for preparation and cooking. Combine the Greek-style yogurt, salt, and 1/2 teaspoon of za'atar. Scoop the mixture into cheesecloth and knot tightly. Place the cheesecloth bundle into a mesh strainer over a bowl. Leave on the counter, at room temperature for about 1 hour, drain the liquid that forms in the bowl and then refrigerate for 24 to 48 hours. The longer you refrigerate, the firmer the labneh cheese will be. When ready, remove the strained yogurt from the cheesecloth and form 1-ounce balls with your hands or a cookie scoop. Place the cheese balls in a jar and fill with olive oil and the additional teaspoon of za'atar. Refrigerate at least overnight. Slice each pita into 8 triangles by cutting in half, then half again to get 4 quarters. Then cut each quarter into two. Combine the olive oil and za'atar in a small bowl and brush both sides of each pita triangle lightly. Place on a baking sheet lined with parchment paper and bake in a pre-heated 400 F oven for 15 to 20 minutes, or until the pita chips are a light golden brown. Whisk together the sesame paste, water, minced garlic and lemon juice until smooth. Season with salt and pepper, to taste. Pour the tahini sauce and hummus into individual dishes and place on or near your serving board. Scatter around the pita chips, nuts, dried fruit, vegetables, pomegranate quarters, honey, marinated labneh balls and any other cheese you are serving. Provide guests with napkins and small knives for spreading the cheese balls on their pita. Learn to Make Goat Cheese with Starter Culture. It's Easy!